In the simulation of continuum mechanical problems of materials with heterogeneities caused e.g. by a grained structure on a smaller scale compared to the overall dimension of the system, or by the propagation of discontinuities like cracks, the spatial meshes for finite element simulations are typically consisting of coarse elements to save computational costs in regions where less deformation is expected, as well as finely discretised areas to be able to resolve discontinuities and small scale phenomena in an accurate way. For transient problems, spatial mesh adaption has been the topic of intensive research and many strategies are available, which refine or coarsen the spatial mesh according to different criteria , , . However, the standard is to use the same time step for all degrees of freedom and adaptive time step controls are usually applied to the complete system. The aim of this project is to investigate the kinetics of heterogeneous, e.g. cracked material, in several steps by developing suitable combinations of spatial and temporal mesh adaption strategies. The dynamic simulation of systems comprising multiple time scales is challenging, as a stable integration of the fast dynamics requires a highly accurate approximation, whereas for the simulation of slower parts a coarser approximation is sufficient and also recommendable with regard to the computational efficiency. One possibility of simulating such systems are multirate integration schemes , , , that treat the slower parts with a relatively large time step, while small time steps are used for highly nonlinear dynamical regions. For the dynamic simulation of heterogeneous material, first suitable time steps are to be assigned to the different regions (identified by P2) of the spatial mesh according to the expected range of their dynamics and appropriate synchronisation strategies are to be developed to perform multirate integration. Then, time step adaption strategies in accordance with the spatial mesh adaption are developed, being beneficial e.g. for P6 and P10. 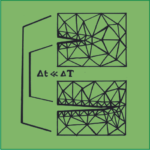 A. Pandolfi and M. Ortiz, “An efficient adaptive procedure for three-dimensional fragmentation simulations,” Engineering with Computers, vol. 18, pp. 148-159, 2002. A. Alshoaibi and A. Ariffin, “Finite element modeling of fatigue crack propagation using a self adaptive mesh strategy,” International Review of Mechanical Engineering, vol. 2, pp. 537-544, 2008. K. Park, G. Paulino, W. Celes and R. Espinha, “Adaptive mesh refinement and coarsening for cohesive zone modeling of dynamic fracture,” International Journal for Numerical Methods in Engineering, vol. 92, pp. 1-35, 2012. S. Leyendecker and S. Ober-Blöbaum, “A variational approach to multirate integration for Constrained Systems,” in Multibody Dynamics – Computational Methods and Applications, vol. 28, P. Fisette and J. Samin, Eds., Springer, 2013, pp. 97-121. T. Gail, S. Leyendecker and S. Ober-Blöbaum, “Computing time investigations of variational multi rate integrators,” in Proceedings of the Multibody Dynamics 2013, ECCOMAS Thematic Conference, 10 pages, Zagreb, Croatia, 2013. M. Arnold, “Multi-rate time integration for large scale multibody system models,” in IUTAM Symposium on Multiscale Problems in Multibody System Contacts, Dordrecht, 2007.